Memorial Card for Samuel L. Hazen, who was born 17 Aug 1836 and died 6 Nov 1923, Age 87 yrs. 2 mos. 20 D.
My research shows that Samuel L. Hazen was the son of John Terry Hazen (1798-1868) and Abigail French (1807-1883). Samuel spent the majority of his life in Muskingum County, Ohio, a good portion of it in Madison and Zanesville. He married twice: 1) Eveline Seton Standley (maiden name Seton, daughter of Joseph and Sarah (Shaw) Seton and 2) Sarah Ann Bowers (daughter of Samuel and Sarah (Wear or Wean) Bowers). Samuel and Eveline had a child in 1861: Sarah Ellen, who sadly lived only two years. In the 1870 Census, Samuel and Eveline are living with two children, Mary and John, whose birth dates predate the marriage of Samuel and Eveline. Their last name is Hazen. It's possible they were from Eveline's marriage to Mr. Standley and took the Hazen name, or they could have been born before the marriage or they could be young relatives of Samuel that he took in. 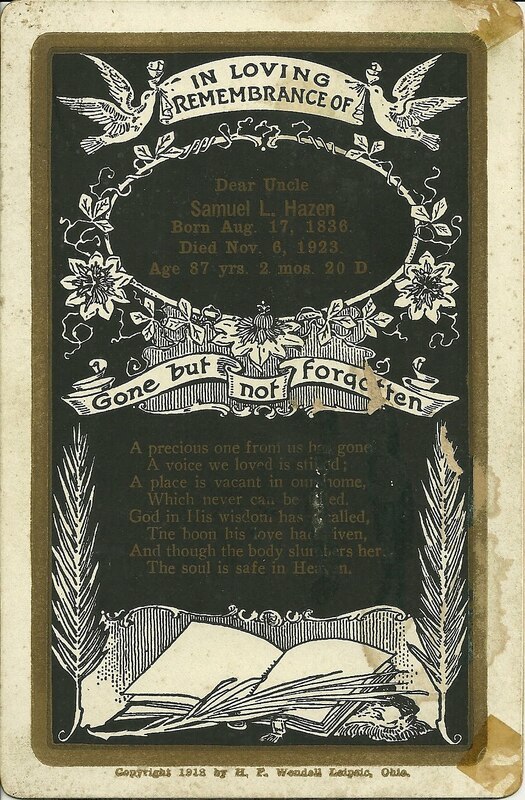 If you have any insights into the family of Eveline Seton Standley or Sarah Ann Bowers or Samuel L. Hazen, please contact me. If you check the 1870 Ohio Census you will find another Samuel Hazen in Washington Twp., Muskingum, Ohio. This second Samuel is living with his mother Abbey (Abigail) and some of his siblings. Samuel L. Jackson is not the son of John Terry and Abigail Hazen. I suspect that further reasearch will probably show that they are cousins. The second Samuel is my Great Uncle. Further research has confirmed that Samuel L. Jackson is the son of John Terry and Abigail Hazen and the husband of Sarah Ann Bowers. However I am not convinced that he is the same Samuel married to Eveline.